Want to see some really gorgeous original glass work? Check out WristFlair on Etsy! 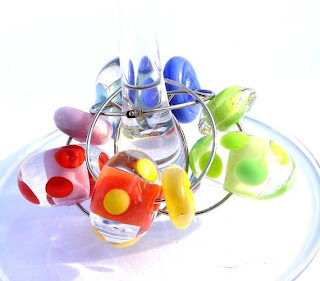 This talented crafter covers a lot of ground making beautiful one of a kind pieces ranging from stunning jewelry to colorful wine charms to unique barware gifts. She has generously offered 2 prizes for our giveaway! Keep reading to find out how you could win! 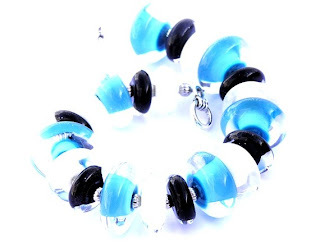 "I have always loved glass pieces in general and finally realized that when it comes to jewelry, I kept picking out glass jewelry. After that, I became interested in how it was made. Once I learned, I decided I really wanted to make my own pieces, pick out my own color combinations, etc. So, in the spring of 2009, and thanks to my husband's help in getting the area and equipment set up, I have my own area to be creative and work on my jewelry. I prefer the "chunky" look when it comes to the beads and jewelry I make." 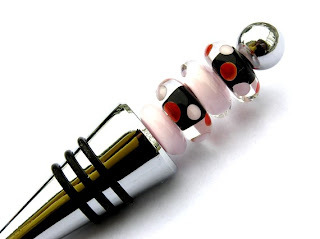 Buy It: Find these gorgeous pieces of functional art at WristFlair! Win It: One lucky ABCD Diaries reader will win their choice of glass necklace and another ABCD Diaries reader will win a set of wine charms(their choice:)!! To enter, sign up to follow our blog via GFC and comment below with something you love from WristFlair. 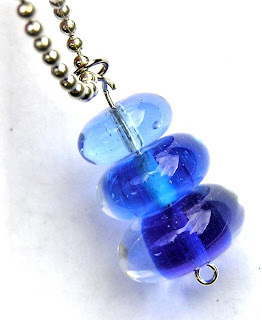 I like the purple and turquoise glass necklace. I love the Berry Orange Glass Necklace. I follow via GFC, thanks! 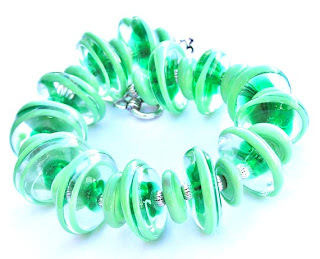 I'm a follower (Cee) and I love the Peacock Polka Dot Glass Lampwork Bracelet. Thank you for this giveaway! I forgot to say for the MANDATORY ENTRY that I love the Rainbow Wine Charms! entered You Can Make This giveaway! I follow you on GFC; I like the apple green and periwinkle bracelet! I entered the Baringo giveaway. I entered the Juice Beauty giveaway. I entered the Sanuk Sandals giveaway. I entered the Bloomsberry Chocolate giveaway. I entered the Everybody's Hero giveway. I entered the cook in the kitchen giveaway.